[Thursday, October 1, 2009] Space Exploration Technologies (SpaceX) has announced a second user conference for its commercial product DragonLab(TM), a free-flying, reusable spacecraft capable of hosting pressurized and unpressurized payloads to and from orbit. [Friday, October 2, 2009] On October 4, 2009, the X PRIZE Foundation will celebrate the fifth anniversary of the largest prize in history, the $10 Million Ansari X PRIZE - won by the Mojave Aerospace Ventures team for the historic flights of SpaceShipOne. [Saturday, October 3, 2009] In less than two years, one or two suborbital spacelines are expected to be operating commercially. In four years, there may well be five or six such spacelines, and daily, if not more frequent, flights may be common. [Saturday, October 3, 2009] A 120-minute global event featuring musical performances, the Poetic Social Mission seeks to raise awareness through artistic illustration of the humanitarian struggles and solutions associated with water. [Monday, October 5, 2009] NASA/JSC plans to issue a sole-source modification for a 3-month extension with an option for an additional 3 months to the current Cargo Mission Contract (CMC), NNJ04AA03C, with Lockheed Martin. [Tuesday, October 6, 2009] NASA selected 152 proposals for negotiation of Phase 2 contract awards in the Small Business Innovation Research program, or SBIR. The selected projects have a total value of approximately $91 million. [Tuesday, October 6, 2009] Space Exploration Technologies (SpaceX) announces the successful completion of acceptance testing of both the Falcon 9 first and second stages in preparation for the first flight of Falcon 9. 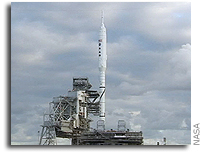 [Tuesday, October 6, 2009] Ad Astra Rocket Company's VASIMR(R) VX-200 rocket prototype reached its highly- coveted 200 kW maximum power milestone at 11:59 am (CST) in tests conducted at the company's Houston laboratory. [Wednesday, October 7, 2009] This modification, valued at $15,000,000, applies funds from the American Recovery and Reinvestment Act of 2009. [Thursday, October 8, 2009] NASA will host its second annual NASA/JPL Small Business Symposium and Awards Ceremony Nov. 16 and 17 at the Marriot Bethesda North Hotel and Conference Center, 5701 Marinelli Rd., Bethesda, Md. [Thursday, October 8, 2009] Masten Space Systems successfully completed level one of the Northrop Grumman Lunar Lander Challenge X Prize Wednesday. [Monday, October 12, 2009] Guy Laliberte, founder of Cirque du Soleil and the ONE DROP Foundation, unveiled the artistic concept behind his poetic social mission, which will be carried out from the ISS. This is the first ever artistic and social event to originate from space. [Tuesday, October 13, 2009] Business leaders interested in learning more about government contracting and what local and national vendors have to offer should attend the "Business Opportunities Expo 2009" on Oct. 20. [Tuesday, October 13, 2009] NASA is partnering with the U.S. Air Force Research Laboratory to develop a technology roadmap for the commercial reusable launch vehicle, or RLV, industry. [Wednesday, October 14, 2009] In the summary report released by the White House's Review of U.S. Human Space Flight Plans Committee on September 8, there was strong consensus for utilizing the commercial space industry for crew transportation to the International Space Station. [Wednesday, October 14, 2009] Alliant Techsystems has delivered a technological first to NASA: a full-scale, crew module structure made of composite materials. [Wednesday, October 14, 2009] Your request that commercial providers should prove themselves via cargo delivery is easily answered since it has already occurred. As a matter of fact, mere hours after the commercial space meeting you convened in delivering a communications satellite. [Thursday, October 15, 2009] NASA has not always implemented appropriate controls to sufficiently protect the confidentiality, integrity, and availability of the information and systems supporting its mission directorates. [Thursday, October 15, 2009] Jazz Semiconductor, a Tower Group Company and ADSANTEC, a fabless design house, today announced their SERDES solution has been selected by NASA for its Lunar Atmosphere Dust Environment Explorer (LADEE) mission. [Friday, October 16, 2009] No duplication was found in the areas selected for an in-depth review; Policies, procedures and mechanisms are in place to avoid duplication; and NASA personnel actively seek to coordinate and to avoid duplication with other federal agencies. [Friday, October 16, 2009] NASA has been recognized for 40 years of shared project management success by the Project Management Institute, or PMI, of Newton Square, Pa.
[Monday, October 19, 2009] Nineteen teams pushed their robotic competitors to the limit and three teams claimed a total of $750,000 in NASA prizes for their hard work and innovation at this year's Regolith Excavation Challenge held at NASA's Ames Research Center on Moffett Field. [Tuesday, October 20, 2009] EADS, a global leader in aerospace, defense and related services, has named Sean O'Keefe as Chief Executive Officer to lead the operations of EADS North America. [Tuesday, October 20, 2009] Alliant Techsystems and NASA made history today as the Ares I-X rocket rolled to the launch pad, marking the first time in more than 25 years a new vehicle has left the Vehicle Assembly Building at Kennedy Space Center. [Tuesday, October 20, 2009] To celebrate the Solar System Premiere of Columbia Pictures' new animated comedy Planet 51, which will be released in theaters on Earth November 20, 2009, the film is currently orbiting the planet on the International Space Station! [Tuesday, October 20, 2009] Today, the U.S. House of Representatives passed H.R. 3819, a bill to extend the commercial space transportation liability regime, by a voice vote. [Tuesday, October 20, 2009] I have been told that many if not most of you in this room today are investors. Well, so is NASA. We are all investing in our future in one way or another. [Wednesday, October 21, 2009] Space Exploration Technologies (SpaceX) successfully conducted two static firings of the first stage, nine engine cluster for its Falcon 9 launch vehicle. [Wednesday, October 21, 2009] Suzanne Kosmas (FL-24) and Bill Posey (FL-15) introduced legislation to help minimize the impact of the impending human spaceflight gap on Central Florida's economy by encouraging the development of the commercial spaceflight industry. [Wednesday, October 21, 2009] SpaceX has announced a second user conference for its commercial product DragonLab, a free-flying, reusable spacecraft capable of hosting pressurized and unpressurized payloads to and from orbit. [Wednesday, October 21, 2009] NASA's Johnson Space Center in Houston kicked off an experimental programming competition today in conjunction with TopCoder, Inc. and researchers from Harvard Business School and London Business School. [Thursday, October 22, 2009] After an extended period of writing and editing, the Augustine Committee's final report was delivered to the White House yesterday. Today it was released to the public at a media briefing held at the National Press Club in Washington, DC. [Monday, October 26, 2009] NASA has completed a review of the Ares I-X development rocket's readiness for its flight test and selected Tuesday, Oct. 27, as the official launch date. Liftoff is scheduled for 8 a.m. EDT from NASA's Kennedy Space Center in Florida. [Monday, October 26, 2009] The purpose of this task order is to develop a set of human system integration requirements for application to commercial spacecraft in support of NASA's Commercial Crew and Cargo Program (C3PO). [Monday, October 26, 2009] Governor's Riley, Barbour, and Jindal today announced the launch of The Aerospace Alliance, a 501(c)(6) private/public organization that will establish the Gulf Coast and surrounding region as a world class aerospace, space and aviation corridor. [Tuesday, October 27, 2009] The contractor shall furnish all labor, equipment, materials and related activities necessary for the RECOVERY Commercial Crew Enabling Initiatives - Upgrades to Launch Complex 40, at the Cape Canaveral Air Force Station. [Tuesday, October 27, 2009] The race for the $2 million Northrop Grumman Lunar Lander Challenge (NGLLC) incentivized prize purse, funded by NASA and presented by the X PRIZE Foundation is coming down to the wire. [Tuesday, October 27, 2009] Today NASA announced under the terms of two Space Act Agreements, it will partner with MSGI Security Solutions Inc., San Francisco, to advance solar cell technology and develop nano-chemical sensors. [Wednesday, October 28, 2009] On Oct. 28 & 29, Masten Space Systems will be the second of three teams attempting to complete the requirements for the Level 2 portion of the Northrop Grumman Lunar Lander Challenge (NGLLC). [Wednesday, October 28, 2009] Rising into the Florida sky, the 327-foot rocket thunders away from the launch pad, marking the first time a new vehicle has launched from the complex since the first space shuttle launch in 1981. [Thursday, October 29, 2009] Many of us have been rescued from unfamiliar territory by directions from a Global Positioning System (GPS) navigator.